VariSpeed: change pitch of the song to match your instrument (Pro edition only). Route Group or Effect Return sections to soundcard outputs (Pro edition only). Mixer / Effects automation (Pro edition only). Over 25 high quality audio effects (more). Use VST / AU (Mac) plugins. Powerful effect sidechaining options (Pro edition only). Supports third party VSTi / AUi (Mac) plugins. 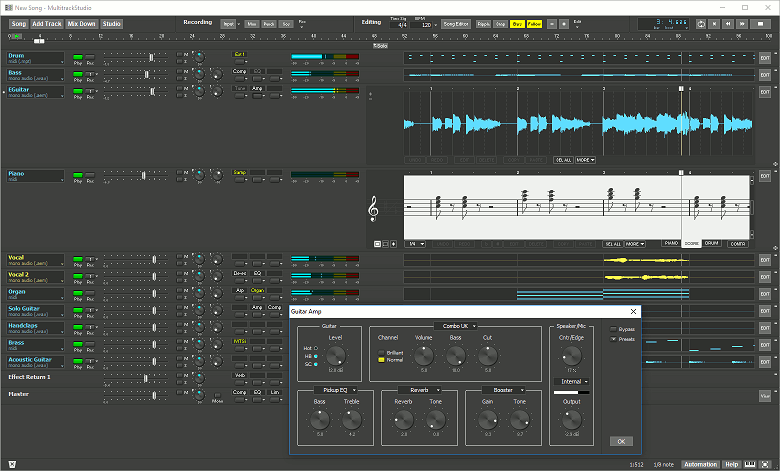 Windows 10/8/7 multi-touch supported (most notably in the onscreen MIDI keyboard). Works with 10 inch Windows 10/8 tablets. Also works with Windows Vista/XP (single touch). Context sensitive help system: point the mouse and press F1 (Windows) / Shift-Command-? (Mac). You can try MultitrackStudio Lite for free. Its main limitation is that it can't handle more than 3 tracks.